Perform two to three reviews per month. Keep current their availability to review on the website. Maintain an up-to-date email address for correspondence with the journal. Have an updated CV on file with journal office. Reviews must be completed within 14 days from date of the initial request. 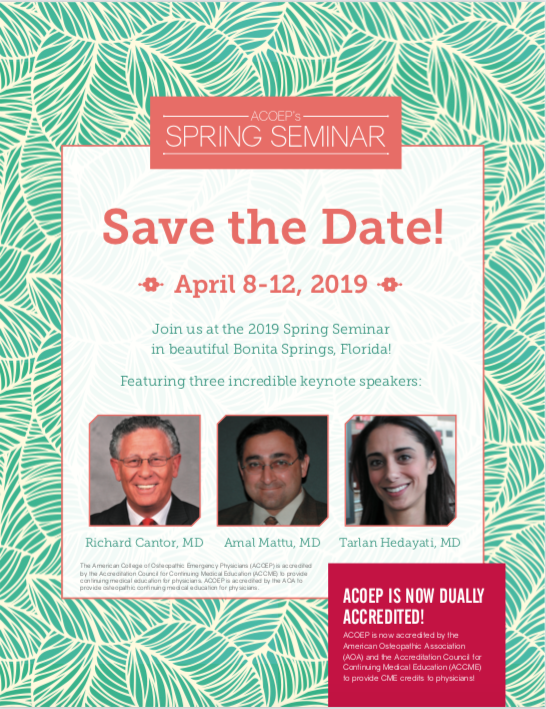 If a reviewer does not reply within 3 days of initial invitation, an automatically generated electronic reminder will be sent on days 3, 5, and final reminder on day 7. 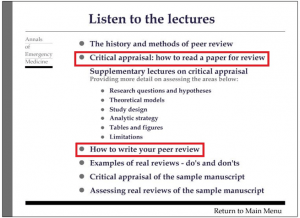 If a reviewer does not respond to any of the requests to review, the reviewer will receive a written correspondence from the journal releasing him or her as a reviewer. Reviews must be thorough and contain a basic amount of information in order for the section editor to generate a composite review. 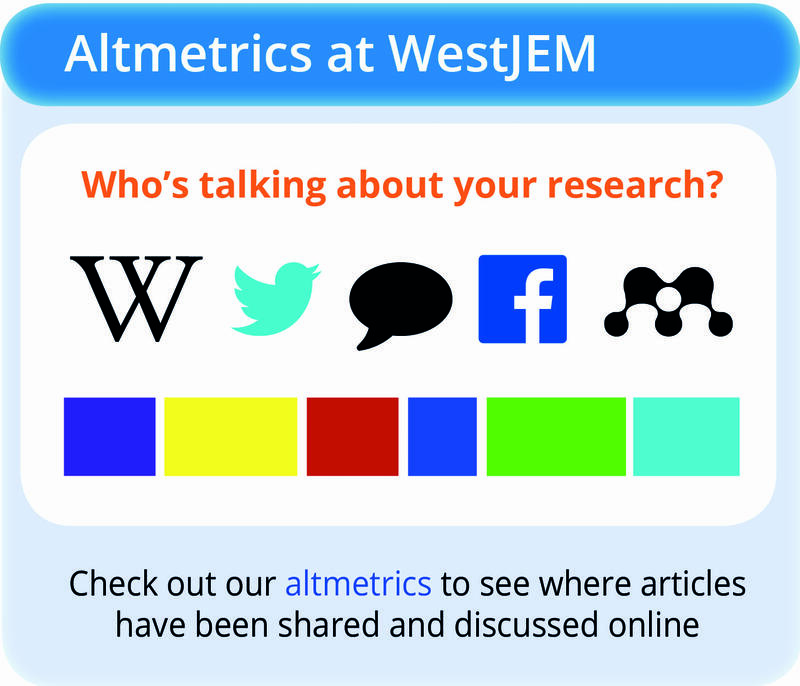 An annual update detailing the number of reviews performed over the preceding calendar year and an official letter of thanks on WestJEM letterhead for your academic record and promotion. 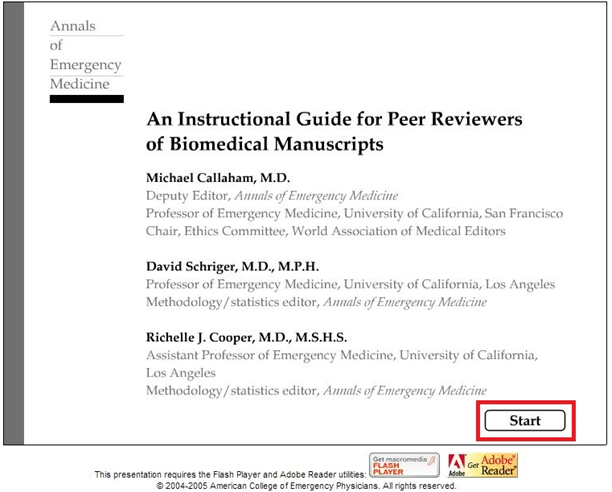 Yearly acknowledgement of best reviewers in print. 1. Click on the “Start” Button in the bottom right corner of the module. 2. 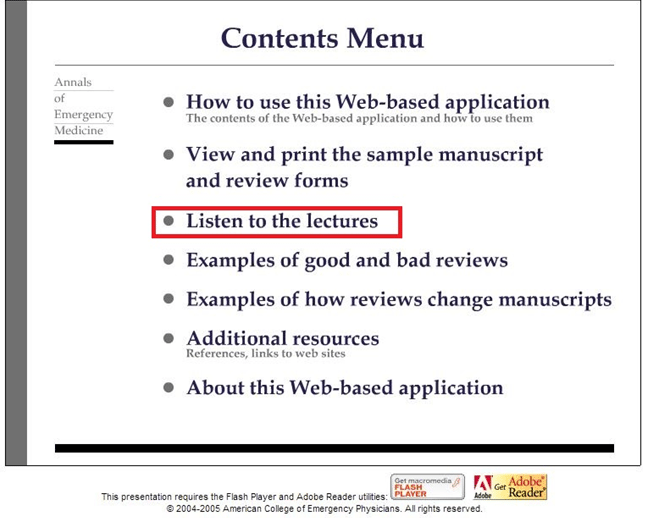 Click on the “Listen to the lectures” link in the module. 3. 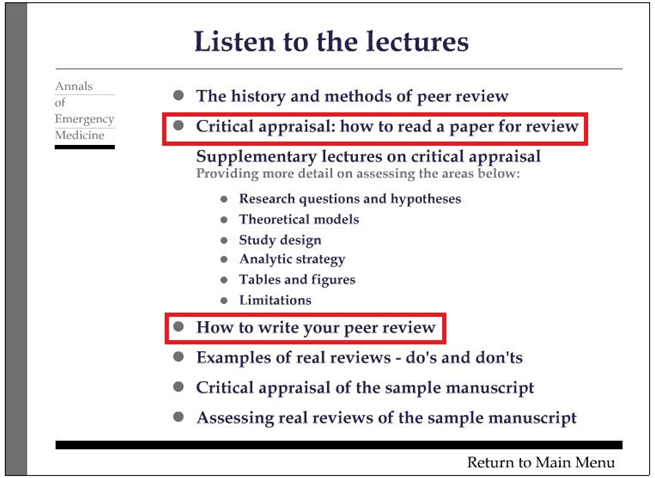 Click on the “Critical appraisal: how to read a paper for review” and then the “How to write your peer review” links and complete these modules. 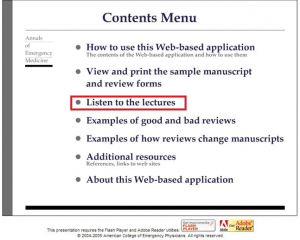 Note: Adobe Acrobat Reader and Macromedia Flash Player are required. 2. Click the “Manage Submissions” link. 3. You will be prompted to log in with your email address and password. 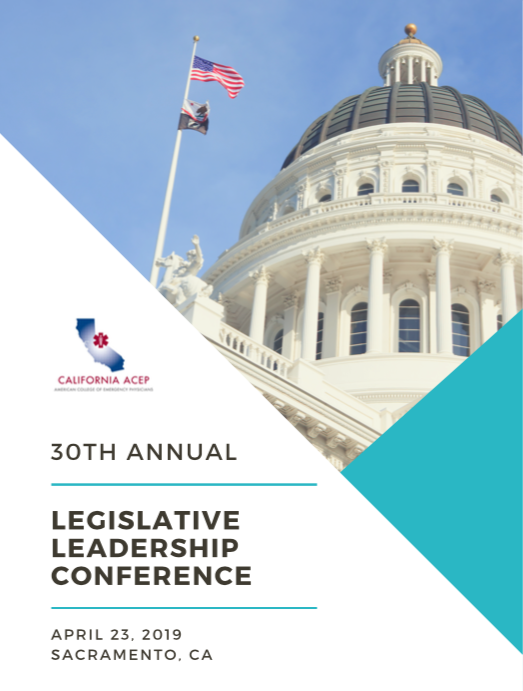 Enter the appropriate information and click Login. Under “My Account” is where you can edit your profile. 4. Now that you’re in the “My Journals” page, you can access the article you are reviewing by clicking on the “Review Submissions” followed by the title of the article. 5. To submit the review, click on the “Will do review” link. 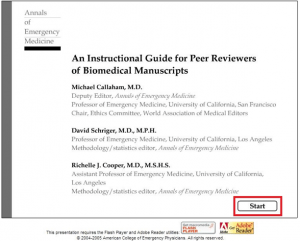 Download the manuscript by clicking on the Submission Manuscript file. 6. To enter your review of the submission, click on “Review” in step 4 and enter your comments for either author, editor, or both. You can also upload word documents and additional files for the review in step 5. 7. Cover Letter (optional): Please provide a confidential cover letter that only editors can read, even if your report is shared with the author(s). This file may be uploaded as a text, PDF, or Word file under step 5 OR pasted directly into the space provided on the page in step 4. 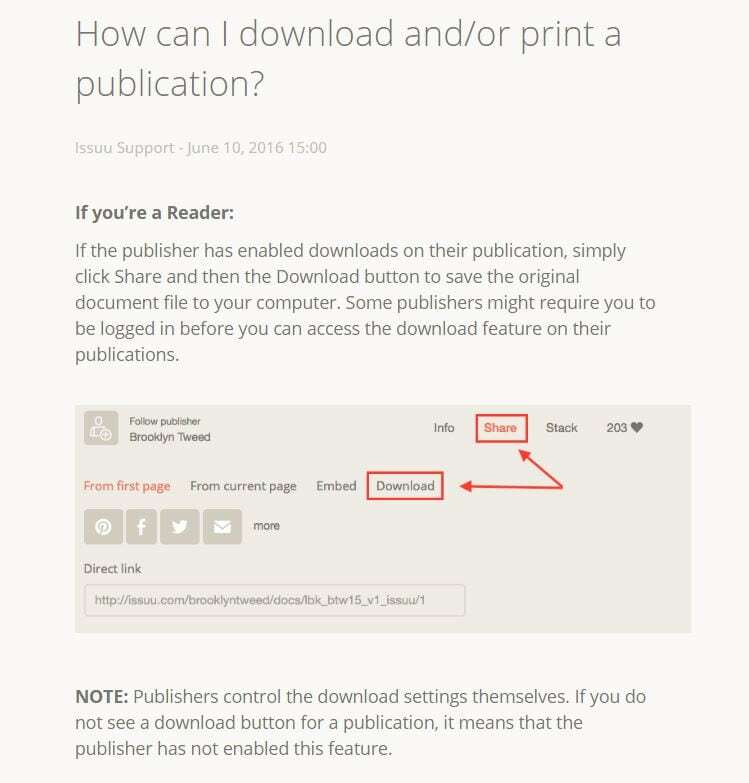 If you upload your document under step 5 as an additional file, only the editor initially can view the file. Permissions must be granted by the editor for the author to view the file. 8. After your review is complete and your comments have been uploaded, click on a recommendation and submit the review to the editor. 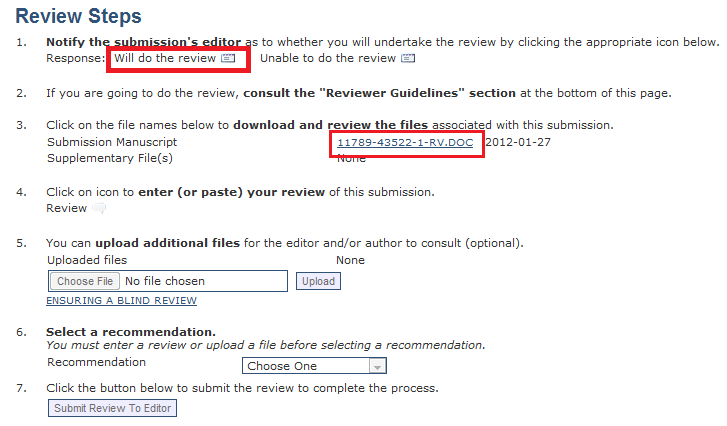 Please note that once the review is submitted, you cannot change any part of the review. Please submit reviews as plain text files, RTF files, PDF files, or Word documents. The reviewer’s identity is removed from the author’s view on the website. Please do not disclose your identity in the actual text of the review. 9. 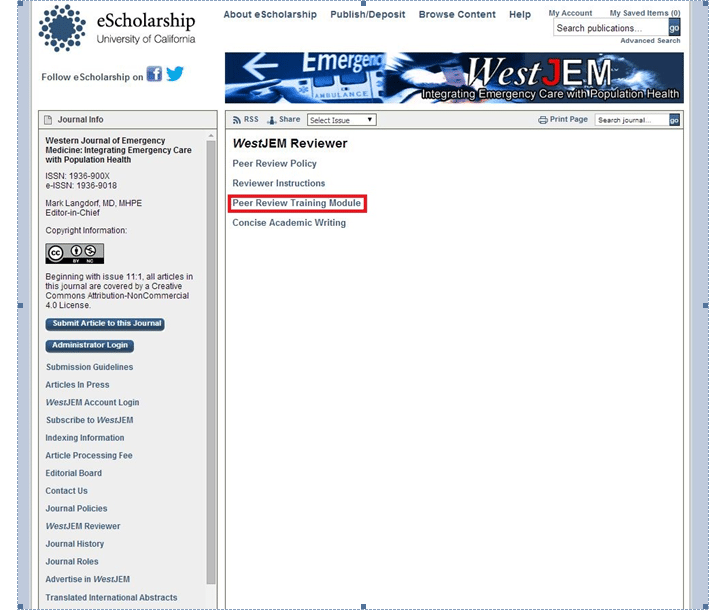 After completing the forum and clicking the “Submit Review To Editor” link, you will be prompted to send an email to the editor. Please send the email to let the editor know you have finished your review. 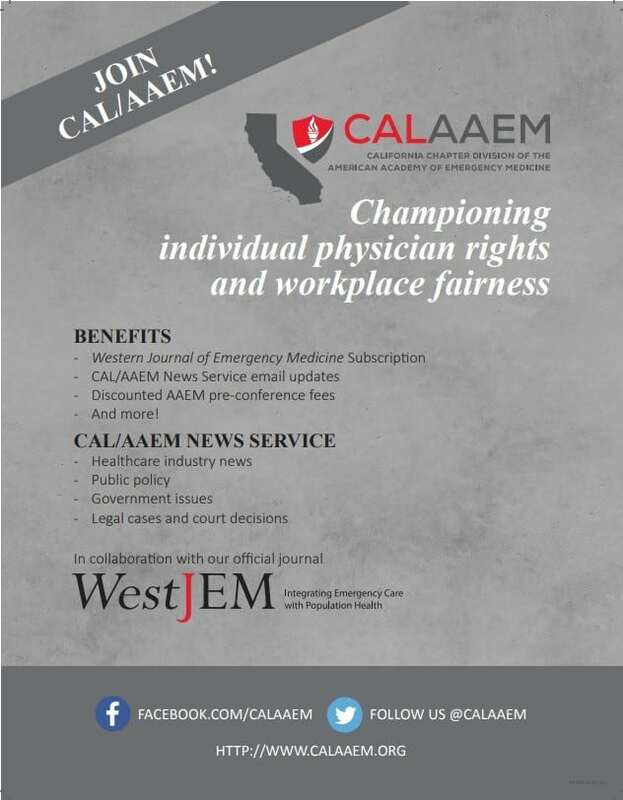 Questions can be directed to WestJEM’s editorial office at editor@westjem.org.